Thick toenails can be a real problem for some of us and cutting such nails require special tools and a lot of patience. If we don’t keep them under control, they can become extremely painful leading to more problems such as ingrown toenails. Before reading my review on some of the best heavy duty toenail clippers for thick nails or ingrown toenails and if you are really serious about getting rid of yours, you should consider following these tips as soon as possible. Avoid wearing sweaty socks inside work shoes or boots. 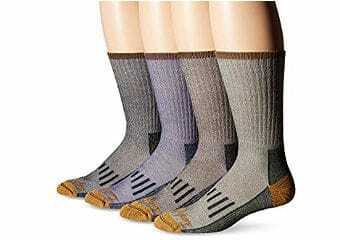 If possible, try to change them as soon as you start sweating or wear sweat absorbent socks. Keep the thick nails well trimmed. This will not only reduce the pain while walking but, if you are using some topical medicine for fungus, it will make it easier for the medicine to reach the part of the nail that needs to be treated. If you haven´t done so already, see a doctor to address the underlying cause. Sometimes the nails get thicker due to age but in many cases there are other factors that cause such problems such as diabetes, fungus, pregnancy etc. 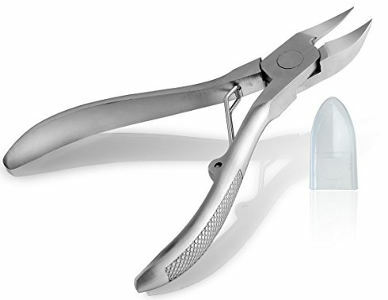 Here I have selected some of the best toenail clippers for thick nails which can help you cut them with ease until you have determined the root cause of the problem. 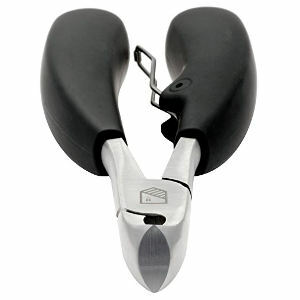 TheClipPro-Kohm Toenail Clipper/Nipper is made for Thick/Ingrown Toenails. It is 5 inches long and includes a safety tip cover and a storage pouch. It is made from high quality stainless steel and is a great tool to cut thick toenails because its blades open up a little over 1 inch and the blades are curved to contour around the nails. You will find that it´s very easy to grip, the ridges on the handle are designed for that purpose and to prevent any slippage. It´s very simple to clean as well using alcohol after each use. The company offers a full money back guarantee. It is very sturdy and super sharp. The grip and the length makes is easy to use. It cuts around the corner much easier than a regular scissor. 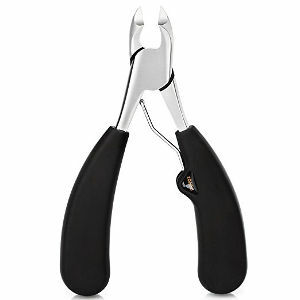 The Podiatrist’s Toenail Clippers are made from medical grade stainless steel which won´t rust or corrode. The quality of this toenail tool will ensure that the blade stays sharp for long period. In the beginning, you must be careful because the blades are razor sharp, which will cut smoothly through thicker nails. This tool is ideal for people with damaged nails due to diabetes or psoriasis. While the ergonomic design provides a good grip for seniors, the plastic tip cover protects the blades and prevents any injury. 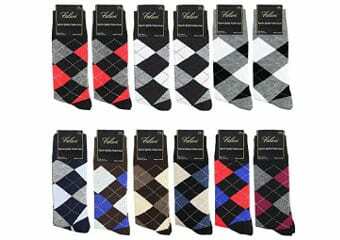 This product comes with an unconditional 100% Money Back Guarantee and the company offers a no hassle refund if you are not fully satisfied. A great tool for the seniors, making it much easier to cut nails. Good overall quality and finish for an inexpensive clipper. Does a good job on cutting the painful skin calluses on the sole of the feet. 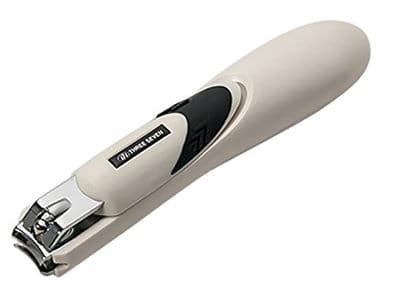 The Harperton Nippit Precision Toenail Clippers have a unique handle design which gives it a good grip andis coated with a non-slip material. It will easily clip thicker or ingrown toenails. The nippit has been designed such to allow you to cut from any angle, avoiding any nicks and cuts.The blades´ edges are hand finished to ensure a clean meeting point so it requires the least effort to cut even the most difficult nails. This product comes with Harperton’s100% satisfaction guarantee and a lifetime replacement warranty. The wide and sturdy grip. It is very precise to align and gives accuracy for each cut. Fitted cover over the blades is a great safety feature. It cuts so much easier than anything else they have ever tried. 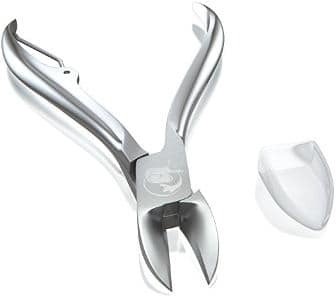 The Chooling Toenail Nail Nipper has double springs for smooth cutting and is made of high quality stainless steel. The blades are very sharp and curved to make the cutting of thickened and ingrown toenails quite easy. The length of the clippers is just under 5 inches. It is available at a good price and the company offers a full 18 months guarantee. They also give a 24/7 technical support if you have any questions or problems. Users give it very high ratings. A great handle which offers a lot of torque when you are trying to cut any stubborn nails. It is very sharp, however, you should be careful when you start using it. Makes it easier to get in the corners and cut the ingrown toenails. The squeeze handles make it a little easier for an older person to use. 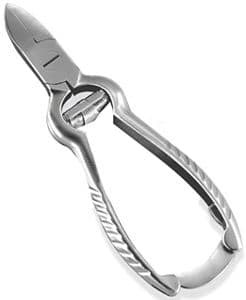 The ZIZZON Toenail Clippers for Thick Toenails are made of premium stainless steel. They have a long and very sharp blade for ease of operation and an invisible inner spring. They also come with a plastic tip cover to protect the sharp pointed blade and a storage case to keep the clipper safely. The pointed end and slightly curved blade will contour around the nails making it easy to maneuver. In addition, the clipper is 4.72 inches long and comes with a no questions asked, 60 days 100% money refund guarantee. The angle of the clipper makes it easy to cut even thick and ingrown nails. The quality is way above average. It cuts through the hardest of nails. 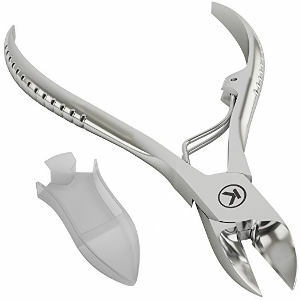 The A Star Nail nipper toenail clippers is a heavy duty clipper with powerful curved blades. The unique handle design makes it very easy to grip allowing you to cut the nails with maximum ease. It has a built in nail file so you don´t need to carry a separate file and comes with a storage pack. The ridges on the handle increase traction and prevent finger slippage. The length of the clipper is 4.92 inches and a lifetime no-hassle guarantee is also offered from Saxhorn. It comes with a thick plastic protective cap to cover the cutting surfaces. The quality far exceeds the money paid for it. Very sharp blades and the built in nail file is a good feature. 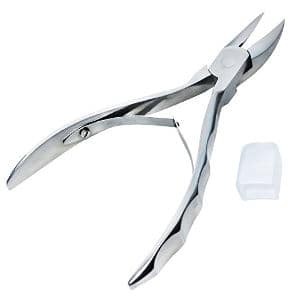 The TOP TENG Nail Clipper/Nipper for thick or ingrown toenails is made of surgical grade stainless steel and a professional double sided nail file is also included in the package. The ergonomic curved handle design allows this nail nipper to cut with ease while the handle with ridges is designed for a good grip without any slippage. 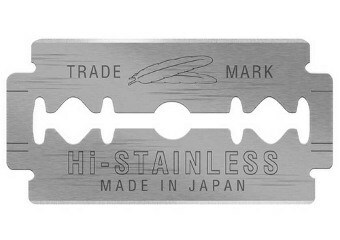 The stainless steel blades are hand sharpened to cut thick nails smoothly and easily with just the right amount of force. The company offers a lifetime warranty. You can simply return the product and they will repair or replace your nail clipper. Well made and heavy duty nail clipper. Spring mechanism is a big help. Comes in a very nice black gift box that is lined in black foam. They are small enough to be easily handled. The Harperton Nail Clipper Set is designed for fingernails as well as toenails. Although the shape of this clipper is like a fingernail cutter, its hard sharpened surgical stainless steel blades will cut the thick nails smoothly and easily. The reinforced and forged clipper handle creates more strength and leverage resulting in less effort even for thicker nails. You will receive two nail clippers, a large and a smaller one, which leaves you with a choice depending on the type of nail you are cutting. It also comes with a lifetime warranty to fix or replace, and if you are not happy with the product, you can return it within 30 days and get a full refund. It has a sturdy grip which results in a clean cut rather than a tear. It has a built in nail file which is of a good quality. It can be hung on a key chain. 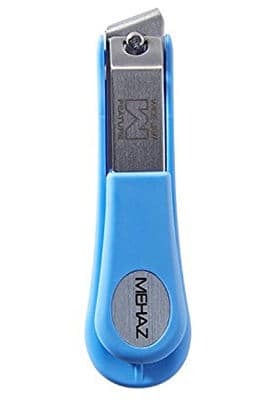 The Mehaz 668 Pro Angled Toenail Clipper has a wide jaw which helps to cut the thicker toenails with ease. The dimensions are 3.4 inches long and the opening of the mouth is 3/16 of an inch. It is made of sanitizable stainless steel. In addition, the handle can be adjusted for the right or left hand users and it also comes with a built in nail file and clipping catcher. The slanting jaw makes it easier for the corners of the nails. The longer size is very useful. It cuts even the thickest toenails very cleanly. 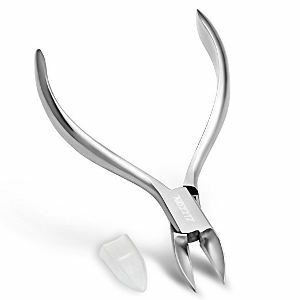 The Keiby Citom Toenail Clipper is a heavy duty toenail clipper made of surgical stainless steel. It is long lasting and rust proof. The blades are sharp and powerful, and the design makes it easy to cut any thick or ingrown nails. 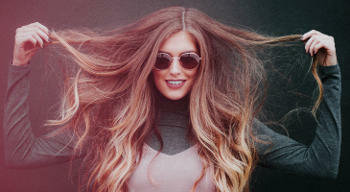 The length is 5.5 inches and the width is 3.5 inches. The handle is designed with ridges to prevent any slippage. This product comes with a storage velvet bag to make it easy to carry as well as a plastic tip cover for safety. It is very sharp and works very well on thicker nails. The reach of the clipper is good for ingrown toenails. Users like the angle of the head. The price is good considering the quality. This Extra Large Toenail Clipper is well suited for Deformed Toenails and Athlete’s Foot. You will also get a separate nail file and a cleaning brush. It is 5.5 inches in length and comes in a neat little box, making it ideal for a gift. 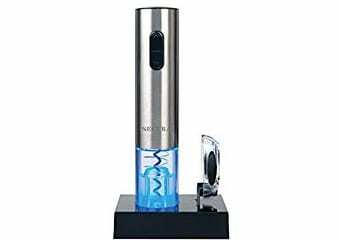 This product´s reviews and ratings are excellent and lots of users like this clipper. It has a strong grip making it easy even for the hardest nails and you will get a lifetime guarantee against any manufacturing defects. The extra large size of this clipper. It cuts through thick nails very easily. It has a wide jaw which cuts through hard nails. Comfortable grip cuts through fast and easy. 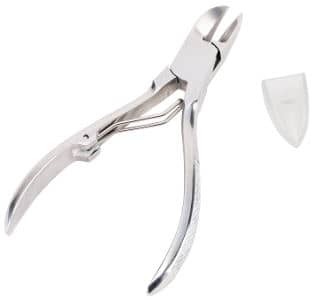 This Professional Nail Nipper is made of heavy duty surgical grade steel and claims to be ideal for ingrown toenails or deformed nails due to fungus, aging, diabetes and pregnancy. It is 4.7 inches long and the jaw opening is over 1 inch. The top of the blades are slightly curved making it easy to cut the curves of the nails. It does not require any cleaning, you just need to wipe it with alcohol, let it dry and store it. A plastic tip cover for the blade to keep the clippers hygienic and clean while in storage is also included. The company offers a 30 days money back guarantee. Opens wide enough to cut the thick nails with ease. Great price for this quality product. 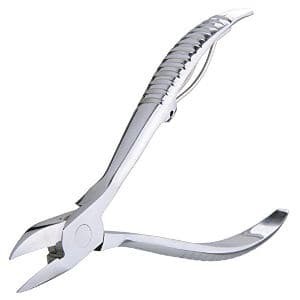 The Toenail Clippers for Thick and Ingrown Nails are made of surgical steel and are hand polished to give it a great finish. A plastic tip cover is provided and this tool comes in a nice box making it a great gift for your loved ones or for any occasion. Apart from cutting thick or ingrown toenails, it does a good job in removing the dead skin with ease. The handle is 3.1 inches long. There is also a 30 days full money back guarantee if you are not fully satisfied. Easy to use and has a wide opening. Very light and well designed. Attractive packaging makes it easy to store. Properly shaped and perfect for both finger and toenails. 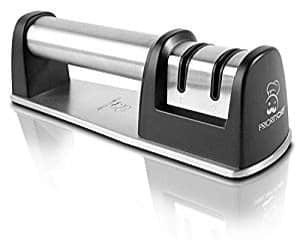 The BEZOX Precision Toenail Clippers Trimmer is designed for thick and brittle toenails caused by nail fungus or aging etc. The handle is made of elastic resin (synthetic rubber), which feels flexible and comfortable, and provides a good grip to easily cut through thick and hard finger or toenails. It is made of surgical grade stainless steel and comes in a small tin which is convenient for storage as well as for a gift. BEZOX offer an unconditional lifetime guarantee and claim that this product will last you for many years. A little pricey but well worth the money. An extra spring is included for the handle. Can be easily rinsed under the water but dry them well before storing. The blades are quite sharp. 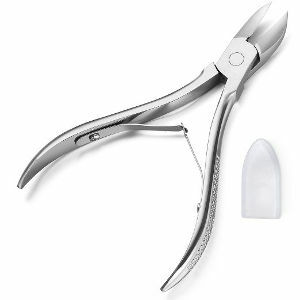 This Professional Toenail/Nail Nipper is made of premium quality surgical grade and brushed stainless steel. 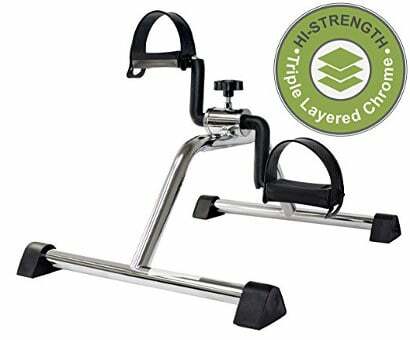 Its curved blades make it easy to maneuver around the contours of nails while the ergonomic design of the handle increases the traction and prevents any slippage. It is 5 inches long and the blade opening is 1inch which is sufficient to cut through thicker and hardened toenails. In addition, its sharp blades have a pointy tip to help fix ingrown toenails. This tool is perfect for professional as well as home usage and comes with a no questions asked lifetime guarantee. Works very well with finger and toenails. The blades are sharp and cut through with ease. 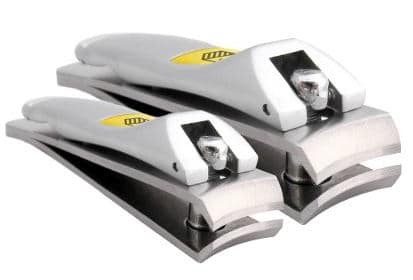 Easy to cut ingrown toenails with these clippers. 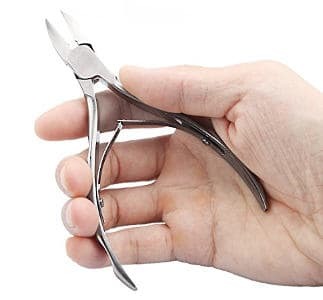 All in all, these were some of the best heavy duty toenail clippers for thick nails available on the market today which will help you have healthier looking and well groomed nails.